No one should say that I will not try anything once. Being a relatively new war gamer, I have none of the biases and deep seated resentments that seem to pervade the minds of les grognards. I will happily try Warhammer as I have nothing against Games Workshop. I looked at Napoleon ( a real stinker, I do not believe they even sell it anymore), as I have never perceived that Foundry has been out to get me. 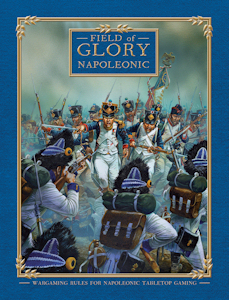 Now we have Field of Glory-Napoleonics from Osprey. I have always liked the Osprey books, nice and concise. Pretty pictures, and who cares if they are not always accurate and that Peter H. may of had something to do with them. I did not even know that there were already Field of Glory rulesets for other eras. 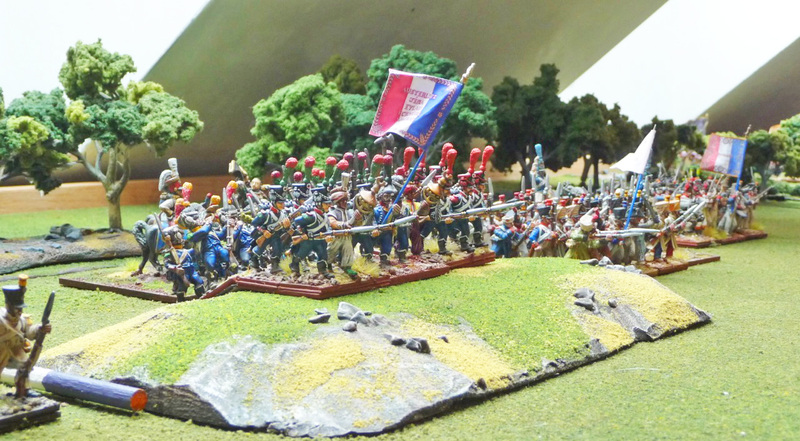 One of the problems with the most recent set I have trialed, Warhammer Historical's Waterloo, is that the company has really decided not to offer any support, and the Yahoo group devoted to the rules is just not getting off the ground (last post > 2months ago). It is almost impossible for someone in isolation to learn a ruleset without support. I believe they might be a good set of rules, their campaign ideas look great and scenarios took an enormous amount of work, but the company just does not seem to be interested. Slitherine/Osprey, the developers of FoG, however, already have quite an active forum and several moderators who all seem to be able to answer questions quickly. The Yahoo group also has started and has daily activity. The book itself is quite nice and although not as image intensive as some of the recent rulesets, it is well organized with diagrams etc. The rules appear to be well ordered. The writing is a little dense and at times the rules appear to be overwrought, but early days. Can not judge a book by it's cover, shall we say. The developers have come up with what I believe is an excellent idea and have made available an abridged version of the rules that is free. This is actually written much more simply than the rulebook and does include a starter scenario with a division aside. So what is FoG-N and why am I interested. I like Black Powder and Lasalle, both good games, but they are both division level rulesets and I have been look for a Corp/Multicorps set. That is apparently for what FoG is written. Sounds good, and like I said earlier, I willing to try anything that is new and shiny. So is it like the other FoG rulesets? Well from the wingeing that is obvious on the forum, it does not appear to be so. All the old FoG diehards are complaining that it is different i.e. does not work the same, different mechanisms etc. etc. So if you are against FoG on principle, the rules still might have interest to you. Next the basing: They do spend an inordinate amount of time on the forum going over how to base for the game. It is a little idiosyncratic, but at the same time I am quite confident that you can use any basing you want as long as you can approach the footprint for each unit as required for the ruleset. So what is the basic tactical unit? Well it appears to be either and infantry regiment or a demi-brigade, a cavalry regiment or an artillery battery. I can her the screams now about not using battalions etc, but it really does not matter, as after all this is a game where there can be multiple corps per side. What is important to me is that I can using my existing basing scheme and that the units look good on the table. For each branch of an army there are either small or large units. So essentially if one is converting an historical OB into units for FoG it is quite simple. Use the number of men in an infantry brigade and use the following conversion. and on it goes for cavalry and artillery. Quite simple really. In respect to the number of figures on a stand, there are recommendations but again it does not really affect gameplay. So how many stands are in a unit. Well there have to be enough to form the basic formations of column of march, tactical (attack column) or order mince (a line). You can also deploy as skirmishers. So to put it simply you need at least 4 bases to form a small infantry unit, but can use more. Since the recommended base size is 60mm wide for 28 mm infantry figures, and my figures are based on 40mm wide bases, I have decided to go with 6 bases for a small unit (mirrors the required foot print without difficulty) and 9 for a large unit. It works well, but I could have just as easily used the basing for 15 mm figures which requires a 40mm wide base and gone with 4 bases to a small unit. So why is this important, well it is so as the movement and ranges are all calculated in the rulebook by something called MU's (Movement Units). There are different MU for different sized figures from 6 to 28mm and these are based off the basic footprint of each unit. For 28 mm figures the MU is 40mm, so although it sounds complicated it is actually quite simple. I decided to go with the MU for 28mm figures as I like the larger units on the table and I already had a bunch of measuring sticks for Lasalle painted which have 40mm gradations. So what is the plus here. Well this is how I see it, I have all my figures (and there are quite a few now) based at a 1 figure:20-25 man ratio. So an unit of say 36 figures (6 bases) which represents a Austrian battalion of 800 men in Black Powder/Lasalle can represent up to 2000 thousand men in FoG. No re-basing.........all armies can be used for games where the tactical unit is a battalion or brigade. All good! So if I was looking at the 1st Bde/1st Prussian Corps at Waterloo which comprised 3 regiments of around 3000 men each. I would need 3 large units which for my purposes would be 9 bases for each unit, 2 of musketeers (I could upgrade the Prussian units with skirmishers by substituting one of the musketeer bases in each unit with a fusilier base) and 1 of landwehr. Likewise, the 1st Div/1st French Corps comprised 1 brigade of 2000 men and one of 1700 men, so I would have 1 unit of 9 bases and 1unit of 6 bases (I could substitute one of the bases with an artillery piece in one of the units to represent the attached artillery battery). Pretty straight forward, I thought. The entire 1e French Corps of 20,000 men at Waterloo would have 4 infantry units of 9 bases, 4 infantry units of 6 bases, 1 cavalry unit of 6 bases, 5 divisional bases and 5 bases of attached artillery. This is around 60 bases in total or roughly 12 battalions of my present infantry and 6 squadrons of my present cavalry as well as slightly over one battery of artillery. I am already easily there and this does make the rules quite attractive to me. So what does this look like. Well below is a small division aside. This is from the quick play starter scenario as described above. The mixed Austrian-Prussian division of 7500 men in the foreground is made up of a 2 small units of line infantry with attached brigade cannon, as well as a small units of Grenzers and Jaegers. There is also a small brigade of cavalry. 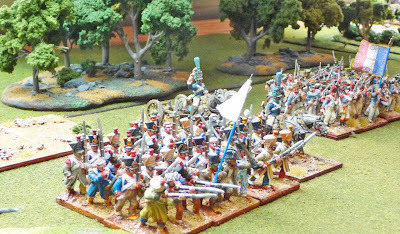 Opposing them is a French division of 5000 men comprised of 3 small units of infantry, a small unit of cavalry and a small unit of artillery (limbered). The set up pretty well exactly is as described in the starter scenario and is on a 4x4' terrain. 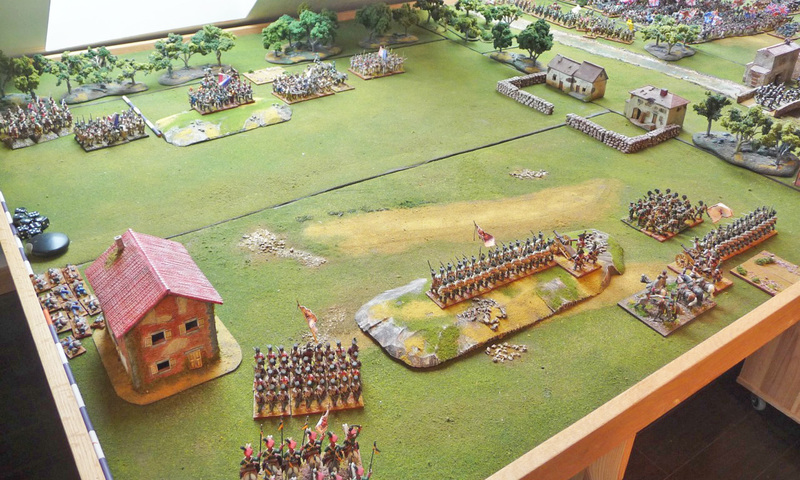 The Austrians are trying to block the French who are fleeing an Austrian/Prussian army that is behind them. The Austrians are allowed to use an extended line formation as you can see below. The infantry are in the extended line while the jaegers are in a tactical formation. 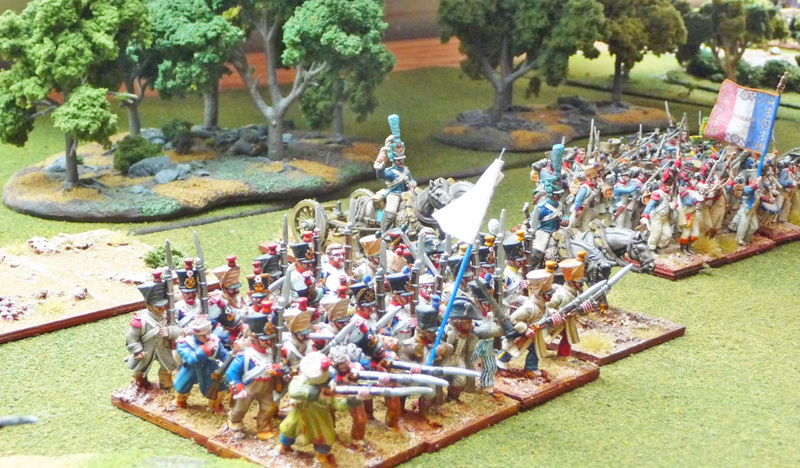 This unit of légere are mounting a small hill, there is an advantage in combat of being up hill. French infantry are only allowed in tactical formation, and can not go into an extended line like the Austrians. Well I have just really touched on the basic premises behind the ruleset. In part 2, I will look at the basic game sequence and combat mechanisms as well as command and control. I should say though that they are not too complex, the specific rules are only 50 pages long. The game is a basic IGO-UGO sequence with phases somewhat similar to Lasalle. Both firing and combat resolution involve the throwing of no more then 6xD6, and then referral to 2-3 tables to decide the outcome. There is no figure removal, and each unit has 4 levels of cohesion from steady-disordered-wavering to broken which are decided by the dice throw and subsequent referral to the tables. There are no saving throws, so I suspect gameplay will be pretty quick. The full colour book itself is 150 pages long, and has a basic introduction to the game and troop types, followed by the 50 pages of rules. There are then sections on Victory Conditions, Terrain/BUA, a basic reference section, a section on how to set up points based games, a section on how to set up historical section, followed finally by an interesting chapter on the design philosophy. There are then two appendixes with multiple comprehensive army lists covering the 1810-1813 period for the Anglo-Portuguese, Spanish, Russian, Ottoman, French, Prussian and Austrian armies. The second appendix has 2 historical scenarios: Placenoit and Sacile. The book also has a very good index at the end (something often missing). All and all a pretty nice book. I do find the writing a little difficult, I do wish the writers were less verbose and the QRS is pretty busy. The free basic quick start rules are simple though, and they do offer me an easy introduction to a ruleset which may be a find. We will have to see. Thanks for posting this. Really interesting read and I look forward to your review of the firing / combat system. An excellent read, I'll be sure to have a look at the abridged version. Thanks!!! Nice review, i found it useful. A good review. I'am a confessed fan of Napoleon's Battles, and I am very curious about this set. Waiting to read more! Thanks for the first part of your write up. I really appreciate the detail you go into - thanks for the extra effort. I'm very interested in these rules and look forward to part two! Well done John - a very interesting and well- written review of NapFOG. It has piqued my interest to try but not so far as shelling out any hard-earned just yet. The freebie you've described may solve that issue - maybe a 'try before you buy' eh? Really good and informative post. to attack enemy infantry units in the field or the building'???? Buildings I can understand ... but 'the field'? As 'Lasalle' is no longer supported by Sam, it looks like it's fate is sealed :( So I might try FoGN. But WHY on earth did the FoGN designers write a set of rules in which a unit fights in "Tactical"?! Why couldn't they just describe it as column??? Tactical to me having read and Played NB represents batallons in column and perhaps mixed order line flanked by 2 columns with the same. It means tactical flexible formations determined by local commanders. At this scale no need to micro manage- great idea in my opinion. Lasalle is not supported by Sam? Really, news to me!!! He has been supportive to me. Interesting review (and the second post adds a lot. I like the choice of a regiment = a unit, which is effectively how I usually game this era. I too had thought I could safely ignore these rules as the parent FoG Ancient rules interest me not at all, but sounds like a set I'd be willing to play with other gamers, if not my first choice, which firmly remain Field of Battle, of course. Re: lack of support - that is a rules *author* issue, not really a company issue. In the case of Lasalle, I'd think the community of gamers would be large enough now to pretty much handle that, but perhaps not. Great work, John--without the benefit of your review(s), I would never have taken a chance on this rules system. Have to admit, I enjoy FOG-N more than Napoleon's Battles which I've played for a while. Definitely my new rules for Napoleonics.